A world with superheroes could be a wonderful thing. With great power tends to come great responsibility, and it seems as though people with the ability to protect those in need gravitate towards such hobbies. Los Angeles has certainly benefited from its superpowered saviors. Gorgon has a particular vendetta against the street gang calling themselves the Seventeens. Mighty Dragon has been keeping an eye on the streets as well, and Stealth seems to be keeping attacks on women in check. And then...the virus gets loose. 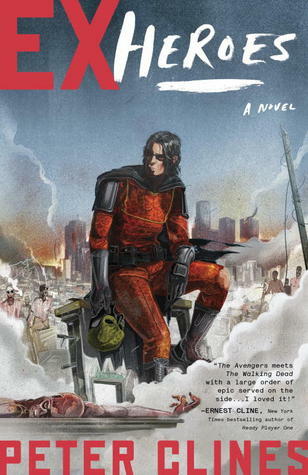 In Ex-Heroes, Peter Cline combines the very popular superhero and zombie genres to create a very interesting post-apocalyptic world. Taking place one year after the outbreak began, with flashbacks to the superheroes' experiences before the crisis, a band of superheroes has made a 'safe zone' out of the old Paramount Studios lot. They go on raids outside of the walls of the Mount for supplies, but have also converted rooftops on the lot to farming land, and are fairly self-sustaining. They're not the only humans left in LA, however. Gorgon's old enemy, the Seventeens, also have a stronghold. Unfortunately, they're not nearly as nice to their civilians as the Heroes are. But beyond that, there's been some strange developments amongst the ex-humans. When the Heroes captured three of the Seventeens, they each attempted to kill themselves in their holding cells. And one of the one who succeeded seemed...intelligent. Instead of launching himself at the nearest warm body, it was able to converse with the Heroes, and tell them what the Seventeens had in store for them. Peter Cline has created a fascinating world in Ex-Heroes, filled with flawed heroes. No one comes through an apocalypse without at least a bit of baggage, and through the flashbacks Cline shows us exactly where each character is coming from. Even the revelation of how the outbreak started is equal parts fascinating and heartbreaking. Ex-Heroes leaves a huge world to explore in subsequent books, characters who have an uphill battle before them, and a satisfying conclusion. Highs: While a bit cookie-cutter to begin with, both female characters hold their own well. Lows: While death is inevitable in a series like this, I wish a few of the characters we lost had made it through. Verdict: An excellent genre mash-up that satisfies fans of zombies, superheroes, and both.